Family reunions can be a tricky affair. On the one hand, it's great getting to reconnect with the people you love and miss...on the other hand, it's also a reminder of the people and things you have escaped. What these type of events in life teach us though, is no matter how much distance you get from your past, it will always have an imprint, whether good or bad. You can choose to deal with it head on or you can choose to hide and cower. No matter what, family is something we do not choose and informs how we navigate life on our own. It's been said that weddings and funerals bring out the best and worst in people, especially in a large family. 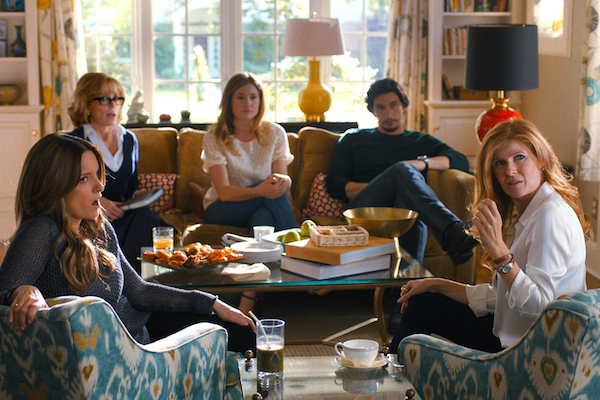 Thus, we uncover the premise of the new movie, This Is Where I Leave You. A new comedy/drama, directed by Shawn Levy (Date Night) and written by James Tropper, based on his novel, which centers around the death of the patriarch of the Altman clan. 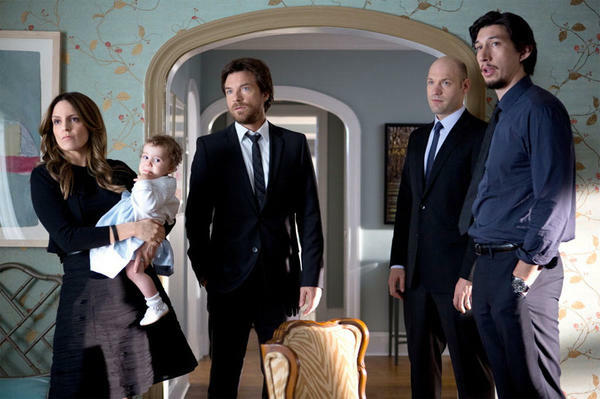 There are four grown siblings: Judd (Jason Bateman), Wendy (Tina Fey), Phillip (Adam Driver), and Paul (Corey Stoll). They are bruised and banged up by their respective adult lives and are forced to return to their childhood home to live under the same roof for a week, along with their over-sharing mother Hillary (Jane Fonda) and an assortment of spouses, exes and might-have-beens. They end up confronting their history and the frayed states of their relationships, among the people who know and love them best. Director Levy is mostly known for handling mainstream comedies like Night at the Museum and Cheaper by the Dozen. This is the first time he has been asked to tackle a movie with darker humane undertones. Unfortunately, he has some trouble handling the tonal shifts of comedy and drama, which feel jarring at certain moments in the movie. Some slapstick slips into the movie and feels a little forced with the rest of the movie. Luckily, since Tropper adapted his own novel, the sharp dialogue stays intact and the honest emotions keep the film grounded over its bumps. The cast is a strong asset in carrying the movie. Bateman, who is always sly and dryly comic in his work, gets to show some understated beats not usually expressed (check out his terrific performance in Disconnect, for further proof). Here his comic skills are in full force and on-point, but he also displays vulnerability and delivers a funny and touching performance, which ranks as one of his best. He has believable chemistry with Rose Byrne, who once again displays her adept comedic skills (someone get this girl a starring comedic vehicle, STAT!). Driver is also a standout as the youngest of the siblings and the most rambunctious. He injects an unpredictable energy that sparks any scene he is in. The rest of the cast is filled out with strong work by Fey, Stoll, the always luminous Connie Britton, as Driver's "older" girlfriend, Timothy Olyphant, as the local neighbor, and Fonda, who gets to display some effective comedic/dramatic chops. Their rapport as a family are some of the best moments in the movie. Tropper tries to cover too much ground in the story and unfortunately, some story lines are underdeveloped in the process, which keeps the movie from being a stronger experience. The story of family dysfunction, coming together through tragic circumstances, is a road traveled in previous movies, so there is nothing groundbreaking on display. That being said, Levy keeps a fairly solid hand on the proceedings and does not allow things to get too over-the-top and allows Tropper's dialogue to stay insightful and witty. Despite its narrative issues, and thanks in large part to a strong ensemble of all-star actors, the movie overall is a solid comedy/drama. One which will probably resonate with audiences who have had to go home to find themselves again, through the shenanigans of an unfiltered family. The cast is perfect and believable as a family. Tropper's funny and insightful dialogue. Touching and heartfelt moments between characters. Too many story lines, with some feeling underdeveloped. Some jarring tonal shifts from comedy to drama.